Somehow Shibuya became 'the' place to be in Tokyo. 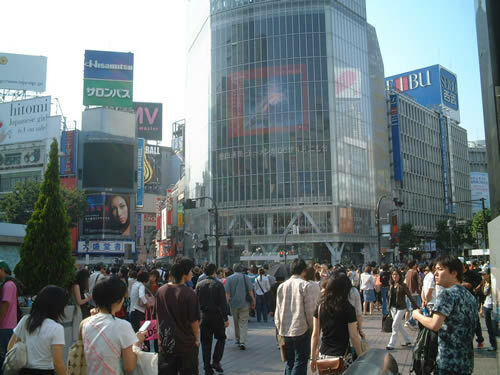 Even more so than Shinjuku and Harajuku, Shibuya is where you go to shop, eat, be seen, meet friends, etc. There isn't any time of day, except maybe around 4 am, where the place isn't teeming with crowds. Walking around Shibuya is good practice if you want to hone your people dodging skills. Keep your elbows out and your wits about you or someone is bound to walk through you. Actually someone will try no matter what you do so usually I do as the natives do and walk right back through them. It gets even more exciting when it's raining and people are carrying umbrellas.... Here it is on a relatively quiet day. So what's with the dog statue you see in the pics? Everyone in Japan knows the story of Hachiko, but do you? Well back in the early 1900's there lived some professor who owned a little Akita named Hachiko. 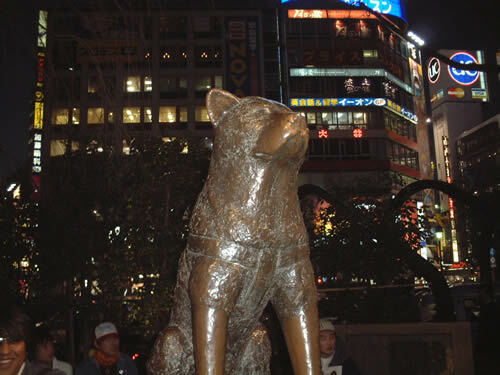 Everyday, Hachiko would come to Shibuya station to meet his master after work. One day the professor died while still at work, and when he didn't show up at the station, Hachiko waited, and waited and kept waiting... until 11 years later Hachiko himself finally passed away. People working at the station would feed and take care of him and other people would come and touch him for good luck. His loyalty was not lost on the Japanese, (who like that kind of thing obviously), so they built a statue for him. These days the area around the statue has become the meeting place when people come to Shibuya, so there's always about a million people hanging around... fun!